The Tiger, the latest film featuring veteran Korean star CHOI Min-shik, ended its five and a half month shoot on May 29th and has been slated by distributor Next Entertainment World (NEW) for a confident December 17th bow. The third feature from The Showdown (2011) and New World (2013) director PARK Hoon-jung, the film tells the tale of the hunt for the last free tiger roaming the Korean peninsula in the early 19th century. 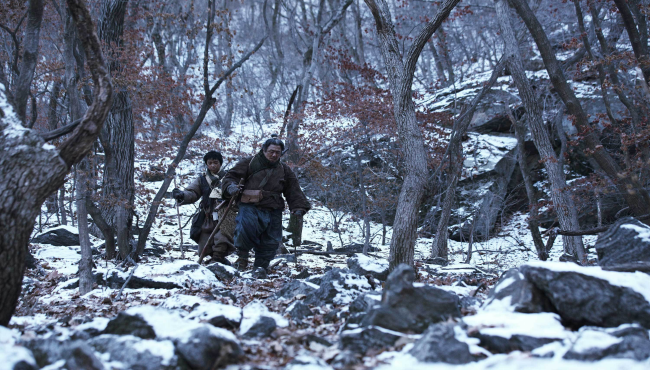 The best hunter in Joseon, played by CHOI, is saddled with the difficult task that carries enormous symbolic ramifications for Korea’s honor during the Japanese colonial period. Redhot following the all-time chart-topping performance of last summer’s and Roaring Currents, for which his role as the legendary Admiral YI Sun-shin netted him a basket of acting accolades, anticipation is high for the next role of CHOI, who made his name in the past through modern classics such as IM Kwon-taek’s Chihwaseon (2002) and PARK Chan-wook’s Old Boy (2003). Also featuring in the film will be noted character actors such as JUNG Man-sik (Miracle in Cell No. 7, 2013), KIM Sang-ho (Haemoo ,2014) and LA Mi-ran (Hope, 2013).